A timely investigation into the heart of a despotic government, TITLE 13 is a darkly comic cautionary tale of mental illness and unconventional love. The novel deftly blends satirical comedy aimed at the hot-button issues of modern society with the gut-wrenching reality of an intensely personal descent into addiction. Young Heald Brown might be responsible for the loss of highly classified TITLE 13 government documents--and may have hopelessly lost himself as well. 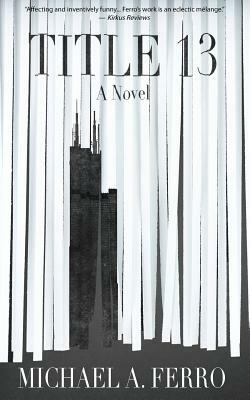 Since leaving his home in Detroit for Chicago during the recession, Heald teeters anxiously between despondency and bombastic sarcasm, striving to understand a country gone mad while clinging to his quixotic roots. Trying to deny the frightening course of his alcoholism, Heald struggles with his mounting paranoia, and his relationships with concerned family and his dying grandmother while juggling a budding office romance at the US government's Chicago Regional Census Center.